What Will My Laser Resurfacing Cost? Who’s doing your laser resurfacing? While you obviously want the most experienced and knowledgeable provider doing your treatment, the truth of the matter is that physicians cost more than other very capable providers. In California, RNs, NPs, and PAs can all perform laser resurfacing in addition to a medical doctor. At Celibre Medical, our nurses are highly trained, laser resurfacing specialists. They have been performing laser resurfacing procedures since we began offering them in 2004. What are you really paying for? As we’ve discussed, there are a lot of different technologies available. You have to make sure you understand and know exactly what procedure you’re going to have and what the expected results are. For example, a less aggressive procedure may cost less; but it may mean that you need a series, which in the long run could cost you more than a single, more aggressive treatment. Also, some clinics offer a laser resurfacing procedure that is more like a chemical peel where only the outermost layer of skin, the epidermis, is removed. This type of procedure costs less, as it’s easier to do. Generally, you only need topical numbing cream and the procedure goes quicker since the skin’s deeper layer, or dermis, is unaffected, so there’s really no bleeding. At Celibre, we don’t do this type of procedure. Because the dermis is where you get your collagen remodeling, these types of laser resurfacing treatments can’t offer much result. We only offer laser resurfacing treatments that incorporate varying degrees of dermal injury. That way you’re going to see big results, especially if your concern is acne scarring or skin laxity. You get what you pay for. It may be cliché, but in many cases it’s true! 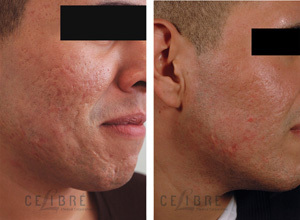 At Celibre Medical, we want you to be ecstatic with your results. We take the time to fully explain the process and walk you through step by step the specific laser resurfacing procedure you’ve chosen from beginning to end. We want you to know what to expect the day of your procedure and everyday after as you heal and recover. We believe that while there are a lot of great technologies available to use for your laser resurfacing, they are only as good as the person performing your treatment. That means experience counts. While anyone can set a dial and fire a laser, our laser resurfacing specialists understand the many nuances to treatment with each device we use. They are highly trained, extremely knowledgeable providers who can help you pick the procedure that not only fits your needs, but also fits your life. We treat you like we’d treat our friends and family, and we encourage you to give us a call today to set up a free consultation so we can talk about how our laser resurfacing program can make you look and feel your best. Contact Celibre today for your laser resurfacing treatment!